When vows are taken it is often difficult to imagine that the bonds of marriage will ever be broken. Unfortunately, not every couple will live happily ever after. Not all family units will stay intact. If it has become clear that your marriage has come to an end it is important that you protect your interests going forward by partnering with a qualified Baltimore divorce lawyer, Allyson B. Goldscher is the advocate you need. Legal issues surrounding child custody, alimony and the division of marital property are complex and require qualified, competent counsel. Ms. Goldscher has emerged as a well-respected family law attorney who brings a commitment and enthusiasm to family law that is unparalleled in the area. She has been named by Super Lawyers’ Magazine as a Maryland Rising Star in family law for five consecutive years (2013-2017). When moving on seems all but impossible, Ms. Goldscher will stand with you every step of the way. Let her put her vast experience to work for you. 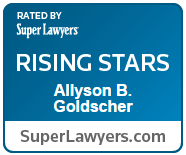 The Law Offices of Allyson B. Goldscher, LLC is committed to helping individuals and families through challenging cases involving divorce, child custody and child support. Ms. Goldscher handles all aspects of family law including adoptions, prenuptial and postnuptial agreements, child support, divorce and child custody agreements. The effects of a family law case, both financial and emotional, can be long lasting. We understand that, the stakes will never be higher. To learn more about our practice, call 410-602-9522 or contact us online to schedule your consultation today. At our Stevenson, Maryland offices, the Law Offices of Allyson B. Goldscher proudly serves clients in the area of family law throughout Baltimore County and Baltimore City.